If dtc p0351 is set, check no. 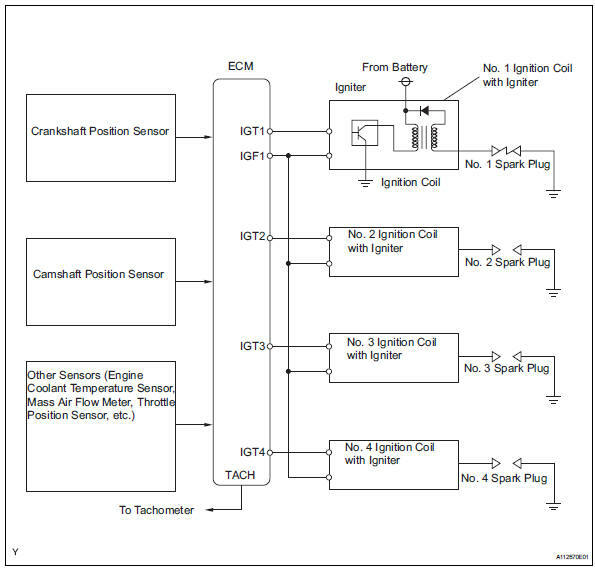 1 Ignition coil with igniter circuit. 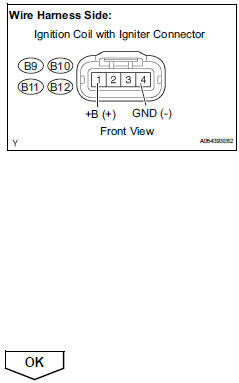 If dtc p0352 is set, check no. 2 Ignition coil with igniter circuit. If dtc p0353 is set, check no. 3 Ignition coil with igniter circuit. If dtc p0354 is set, check no. 4 Ignition coil with igniter circuit. The dis is a 1-cylinder ignition system in which each cylinder is ignited by one ignition coil and one spark plug is connected to the end of each secondary wiring. A powerful voltage, generated in the secondary wiring, is applied directly to each spark plug. The sparks of the spark plugs pass from the center electrode to the ground electrodes. The ecm determines the ignition timing and transmits the ignition (igt) signals to each cylinder. 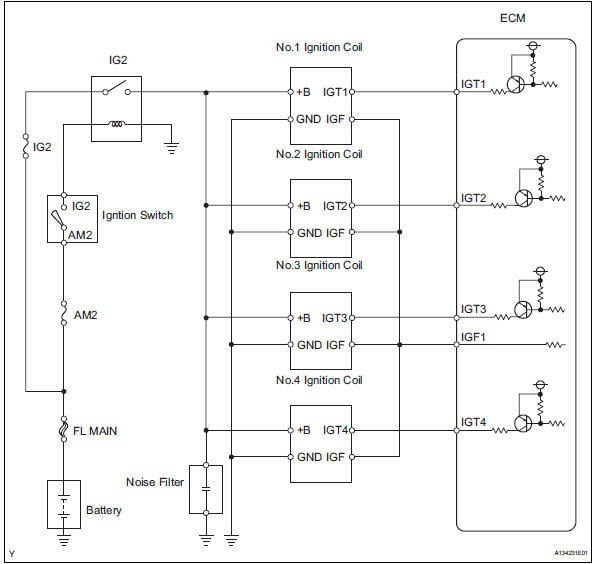 Using the igt signal, the ecm turns the power transistor inside the igniter on and off. The power transistor, in turn, switches on and off the current to the primary coil. When the current to the primary coil is cut off, a powerful voltage is generated in the secondary coil. This voltage is applied to the spark plugs, causing them to spark inside the cylinders. 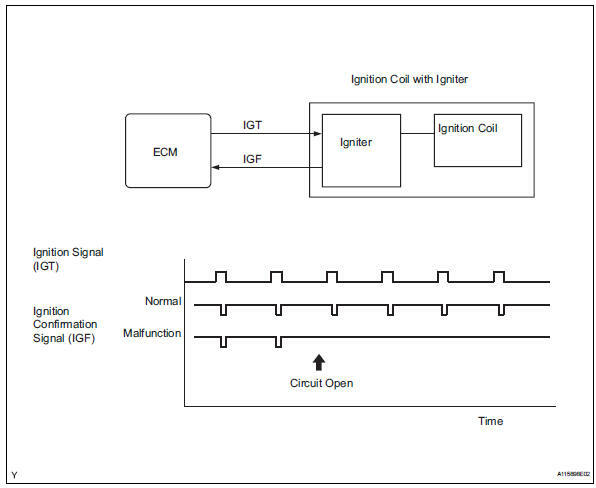 As the ecm cuts the current to the primary coil, the igniter sends back an ignition confirmation (igf) signal to the ecm, for each cylinder ignition. 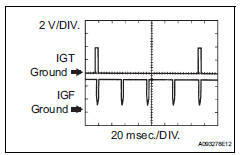 While cranking or idling the engine, check the waveform between terminals igt (1 to 4) and e1, and igf1 and e1 of the ecm connector. If the ecm does not receive any igf signals despite transmitting the igt signal, it interprets this as a fault in the igniter and sets a dtc. If the malfunction is not repaired successfully, a dtc is set 1 second after the engine is next started. 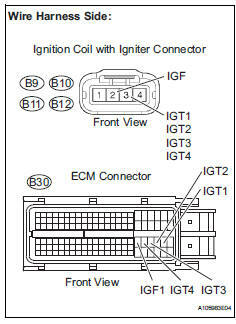 Disconnect the ignition coil with igniter connector. Measure the voltage between the terminals of the wire harness side connector. Reconnect the ignition coil with igniter connector. Disconnect the ignition coil with connector. Shuffle arrangement of the ignition coils with igniters (among no. 1 To no. 4 Cylinders). Check dtcs displayed on the tester.